Vegan friendly potSticker with eggplants, coriander, green onion, shitake mushroom and Chinese mung bean noodles as filling. There are indeed many vegan friendly recipes in Chinese cuisine. Many of them even taste better than dishes with meat. This vegan potsticker is a great example. I use stir-fried eggplants as the replacement of meats. In fact, I guess chicken leg mushroom can do the same. Besides, chopped coriander, chopped green onions and shopped shitake mushroom are also added for a more combined taste. In case you are not familiar with mung bean noodles, I would love to introduce it a little bit. Mung bean noodles is made from healthy green mung beans and present a crystal appearance. It is also named as glass noodles in China. You may find them in local stores or skip this ingredients. But I high recommend using some in the filling. Chinese vegan potstickers with eggplants, corinader, green onions and shitake musrhooms. Peel the eggplants, cut into small cubes and then soak the cubes in salted water for around 10 minutes. Transfer out and drain. This will help to reduce the oil absorbed by the eggplants in stir-fry process. In a sauce pan, heat up around ½ tablespoon of vegetable cooking oil and then stir fry eggplants with mashed garlic until soft. Transfer out. In a large bowl, mix stir-fried eggplants, mung bean sections, coriander, green onion and shitake mushroom with salt, light soy sauce and Chinese five spice powder. Assemble the potstickers one by one. 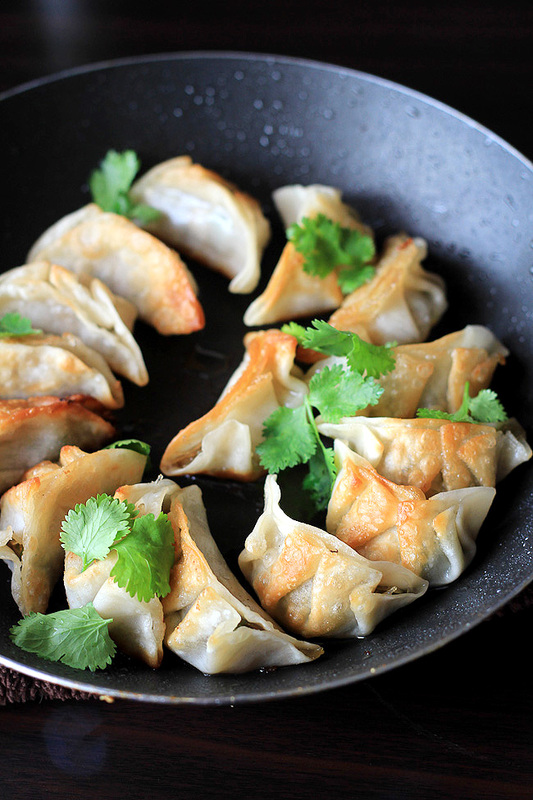 Brush some oil on a pan; lay the potstickers and sauté with medium fire until golden brown. In order to make sure the potstickers are cooked toughly, I would suggest pouring around 1 tablespoon warm water after sauté the bottom side to golden brown. The theory is to steam other parts of the potstickers with vapour. Turn the potstickers over from time to time. Transfer out when the water added are evaporated and potstickers become crispy again. Serve immediately or with chili sauce you prefer.